Shopping for a baby can prove almost as difficult as picking out the right gift for a hormonal teenager. Not because they are picky, but because it’s hard to know what they will get the most benefit from. When my oldest was a year old, I went a little overboard. I didn’t know what the best developmental gift for one year olds was, so I just bought everything. I think my love language must be gift giving, because I tend to go all out for the people I hold near and dear. I am embarrassed to admit how much we spent, but let’s just say it was well over the cost of five or six nice pairs of jeans. I am sure you can relate in some way or another. We all want what’s best for our kids. Unfortunately, we don’t always know what that is. It is these cases that we overcompensate, just in case we maybe haven’t done enough. My second child just turned one (I am not sure how that happened), and so that means I am planning out what developmental gift is right for my one year old. I definitely have experience with what was actually worth purchasing with my first. I included those things in this list because I think you will appreciate the use your little one will get out of it. I also wanted to find something new and exciting for my littles. 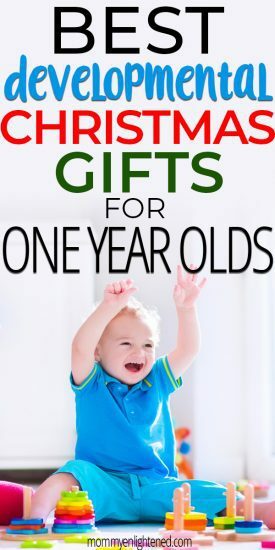 Some things included on this list are developmental gifts for one year old’s that I plan to get her this year. There are affiliate links in this article. You can learn more about this in my disclaimer. This activity cube is an oldy but a goody, and it’s GREAT for your baby’s development. We have a different cube version, but honestly there isn’t a lot of difference between this one and others. This particular toy includes five different gadgets, so if your little one gets bored with one side you can move to another. Remember how I said that we spent way too much money on our littles for her first Christmas? This foam climber is what we purchased. Although it’s pricey, it’s proven its worth time and time again. If you can afford to put the cash out, and you intend to use it for more than one kid–consider it. We have loved having ours. A toy like this is a great way for your child to learn about cause and effect. 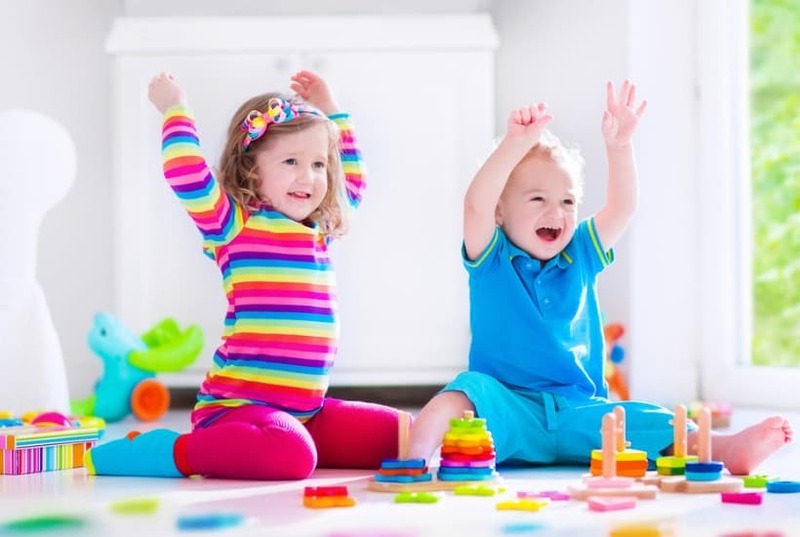 It’s important to work on fine and gross motor skills at this age, and gives you the opportunity to do so. We purchased this V Tech sit to stand for our oldest daughter’s first birthday. It can fold down, which makes it a good toy to play with when they are sitting. It has a ton of different “mini activities”, and it plays exciting music when it’s rolling to help encourage your baby to walk. We actually have a video of my oldest using this to support herself while rolling down our hallway. Our youngest daughter is not walking yet, but she enjoys playing with it in it’s folded position. You have tons of options when it comes to activity tables. The reason we chose this activity table is because I liked that there were “smart stages”, and I like Fisher Price as a brand. We definitely weren’t disappointed. There’s more than 120 songs, and tons of options for interacting. Since our baby isn’t standing yet, we have removed the legs and she just sits and plays with it. I LOVE toys made by Melissa and Doug because they are SO well made, and this elephant rocking stacker is no exception. I feel like this toy puts a fun spin on your typical ring stacker toy. The smooth wood pieces are easy for your littles to grab onto, and it’s a great way to practice motor skill development. I wasn’t that impressed with this busy gears toy when I first saw it, but I have to say it’s actually a lot of fun to play with. Your child puts the gears on the pegs, and than can watch the movement they make once the toy is turned on. Putting the gears in different places will yield different results, so it can be a lot of fun for a long time. Like the activity cube, a bead maze is another classic that your baby won’t tire of for a long time. My mother-in-law purchased one of these for my oldest daughter a couple of years ago, and it’s still played with. 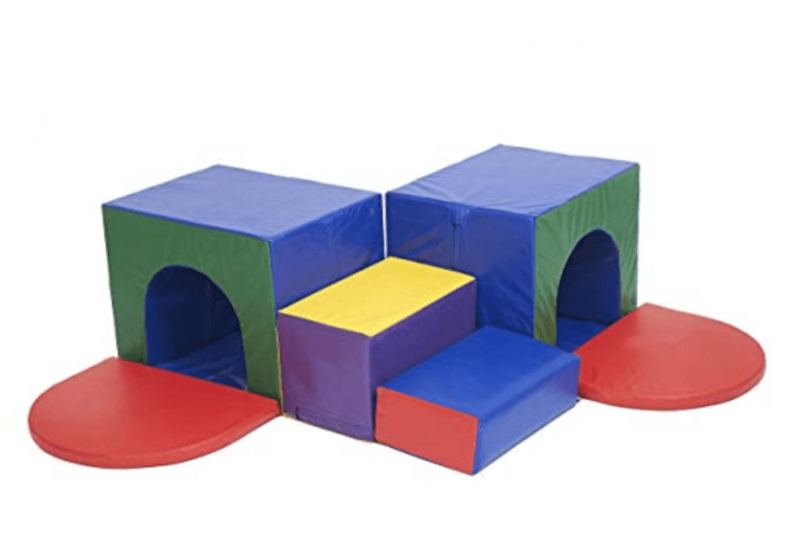 This particular set is known for being fairly sturdy, as well as made entirely of non-toxic materials. It’s not a choking hazard, and there are no rough edges (which is a thing that happens sometimes with these). We bought this Little Tykes activity garden for my oldest’s first Christmas. It unfolds and is the size of your child, so it gives them a miniature house-like structure to play in. Our toddler enjoys making our one year old “knock” at the door and letting her come into the house. It is a toy she hasn’t tired of, so I think it was worth it. We actually own this cute little xylophone toy, as my oldest got it a couple of years ago. She STILL enjoys playing with it, so I think it’s safe to say it’s long lasting. The nice thing about this toy is there are a lot of different options for your littles. They may not have a lot of interest in pounding on the xylophone right now, but I am sure they’ll enjoy playing with the rolling balls it comes with. This little activity cube is somewhat similar to the one listed above, but it’s a little simpler and more electronic. My grandmother purchased this for my first daughter as a baby, who didn’t have a lot of interest in it. My second daughter loves it and still can be distracted by it for a good 5 minutes (which is FOREVER for a baby). Isn’t this piggy bank adorable? What I love about this particular one is that it grows with your child. This toy is safe for kids 6m+, which means it’s a great option if your little one is almost one, but not quite there yet. My oldest daughter has a real piggy bank, and she’s kind of obsessed with putting money into it. Unfortunately we have a one-year-old crawling around, so we can’t leave a bunch of choking hazards all over the floor. So this stride to ride puppy is somewhat similar to the walker I listed up above, but this kind is fun because it can convert into a little tricycle for them to ride on once they are older. I liked this one in particular because it offers a little area for your child to practice putting the shapes into the holes. It does come with fifty songs and some lights, so it will probably appeal to your one year old. We got one of these as a hand-me-down from a friend. It did have all the bells and whistles of the other one, and so my one year old was not as interested. Now that she’s older, she thinks this is a pretty cool toy. These stack and build cups are another classic that you can’t go wrong with. This is a great way to start introducing “building skills”, colors, and shapes. The kinda neat thing about these blocks is that there is a multitude of different ways to stack them. That means as your baby gets a little older, they can still enjoy this toy because they will be able to try and create new things. Board books are an excellent way to help introduce your child into the world of reading. I like this particular book because it’s very simple, colorful, fun to read, and introduces letters. We know that reading to our kids is important, so we set aside a reading time every day. We started this when my oldest was a baby, and it’s one of her favorite parts of the day. 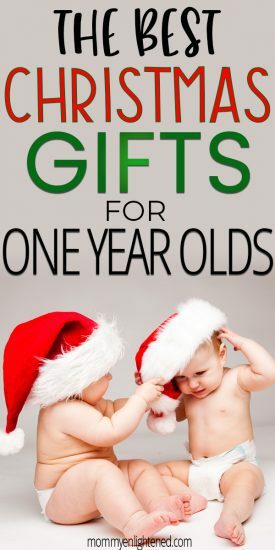 I hope you were able to find the best developmental gifts for your one year old. It’s definitely a struggle to know what they will get the most use out of–and there really is no way to know. What was your favorite developmental gift for one year olds? Is there any I missed that you think should be added? I would love to hear your thoughts below in the comments!